You must make reservations at least 5 minutes in advance of the time at Rudy's Mediterranean Grill. I choose Rudy's often because it is a great central location (we are in Montgomery County and I have lots of friends and family in Baltimore). What a great surprise to find an authentic ethnic restaurant, with fresh and lively choices, live entertainment some days, friendly staff and delicious dishes. I think Rudy's is a GEM! Their Turkish wine is among my favorites and their happy hour with free modest appetizer if you buy a drink, is a great value and the portions are generous. Congratulations to the proprietors of Rudy's for creating a wonderful, inviting space to gather! Treat yourself to the Turkish coffee! I would recommend Rudy's to a friend with one big caveat - if you expect to be able to order from their wine list don't be surprised if they don't have your first or second selection. This happened on Sunday and has been happening ever since we started dining at Rudy's about 5 years ago. Just to clarify, the wine we chose first was not some obscure vineyard. It was Penfolds Shiraz. They of course do have a Turkish wine to replace your order and will offer it to you at the same cost as your original. So my suggestion is don't offer any wines that are not stocked and stop the litany of excuses why your selection in not available. We have been here twice for a girls' night out. We are always well taken care of, and the food is fresh and delicious. The servers are friendly and helpful. It is a generally friendly atmosphere. We will be back again! Great service, excellent menu, many choices. Highly recommend for tasty Mediterranean food. Friend and I were seated, poured waters, and never served again. Disappointed; normally love this restaurant. Amazing Turkish food. The grilled octopus special was simply delicious and the doner was very, very good. Save room for dessert, the baklava was awesome. This was our 1st time eating here, but will not be our last. Food was very authentic Turkish and Mediterranean. The food was excellent. It was very quiet when we were there at 4:45pm on a Saturday. Service was very good. It was a little more expensive than we were expecting but it was out date night and we had not been out in a while. The service was exceptional. The Turkish food was like so tasty, that I literally began to lick the plates. I had lamb before but never had it taste so good as they prepared for me. The Turkish coffee and rice pudding was the perfect combo to satisfy the palate. I plan to visit soon with friends to enjoy the same experience as I have. The ambience is very nice, and the food was authentic and really good! The service was a little bit slow at times, but our waiter was friendly and helpful. The appetizer platter was enough for 5 of us to share easily and was delicious. We also had the grilled octopus, which was equally good. The entrees were tasty. We were a party of 6, and most of us had lamb. There was quite a variety of options. The Turkish wine was excellent. We tried 3 different types - one white and two reds, and all were outstanding. Seated quickly. Prompt service. Excellent diverse menu with great food. Great, healthful food and friendly service. Thank you. My family really enjoys Rudy's, as it has a very family friendly, homey feel to it. Food is consistently good. Our server was pleasant, however we rarely saw him. He put more of his time to serve another larger party. He never came back to check on us once we received our food. Luckily, there were other people in the restaurant who helped him out with getting us our check and take home container. He did apologize and thanked us for being patient. Terrible. Worst service. If I could give negative five stars I would. My fiance and I had a reservation for 8pm and right when we walked in, a woman said they have an event for 9 and they need us to be out by 830/845 to clean. We left since we wanted to take our time and enjoy our food. I'm going to write a terrible review every chance I get. There was no apology or come next time and we'll make it up to you. Nothing, just we have to eat quick or leave. Why allow customers to make a reservation if you need the place empty by a certain time. Absolutely terrible service. This time our meal was just okay, except for the whole bronzino, which was excellent. Our server was forgetful. The appetizers were tasty, but nothing special. Was not impressed! Had to send our server outside twice to see that there were 2 boards on their front sidewalk with specials on them. Server was not at all familiar with the menu. Food was average, I had the salmon, which was good. My husband had a salad which was large and he enjoy, however, there is only 1 type of salad dressing available per our server. Our friend had either a veal or pork shank special which he said didn't have a lot of flavor but tender. Due to the service, we elected to skip dessert and go elsewhere. Love the food at Rudy's. If you want to try authentic Turkish food, this is the place to go. The pide and lahmacun are just like the ones you would find at a bakery in Istanbul. It's a family owned business and they make sure the quality is always very good. If it is crowded, service can be slow, but it's worth the wait. The staff are friendly and make sure everyone is taken care of. The personal touch is quite nice. So if you want to enjoy a great meal with friendly people, head over to Rudy's and enjoy. Food was ok not great. Good variety on the menu. Staff and owner were very nice. The food was amazing and service was as well. The grape leaves were the best I've ever tasted. Definitely recommend going here with a friend, date, or family. Four of us enjoyed a dinner on a recent Saturday night. Everyone liked their food (two lamb shish kabobs, one doner, one chicken and a shared baba ghanoush) and portions were generous. Excellent pita bread -- would love to know where they get it. The restaurant, however, needs to up their game on service. A busy Saturday night should not be a surprise. The servers were extremely pleasant and apologetic, but could not keep up. Our waiter was all over the restaurant. No one ever checked to see how our food was. We waited a very long time after asking for the bill. One other point -- sharp knives are needed (and maybe they have them, but we couldn't catch anyone to ask) because it is almost impossible to cut large pieces of lamb with a butter knife. Excellent, authentic Turkish food. Very well prepared. Came out quickly. The servers were very nice and knowledgeable about the food and the drink offerings. I had a great experience at Rudy's. Excellent Lahmacun, Iskender Kebap, Pide, Künefe, all perfectly made. The apple tart mixed drink was delicious. My party needed special seating for one of my guests who has some accessibility issues, and Rudy's was more than accommodating. Great atmosphere, beautiful interior, good location. I'll definitely be coming back. As always the food was fresh and delicious and the service very attentive and helpful. We are repeat customers who love this restaurant. We had no trouble getting a last minute reservation on Christmas Eve. Being tucked away in a business park this is a gem. The server was genial and the service was attentive but not intrusive. They easily accommodated my mother-in-law with her walker and did not rush us to order. The noise level was very comfortable, but it might be different at lunchtime. The food was as good as any we've had, the Turkish wine recommended was perfect for what we ordered, and the Turkish coffee was spot on. Food was awesome, but service was little slow. Authentic turkish food, enjoyed it. We enjoyed discussing the meal with the waiter. Yummy cocktails, tasty hummus, falafel and eggplant salad. Delicious lamb dish. The spanakopita was a bit disappointing - too much phyllo dough and not enough spinach and feta filling. Overall, a fine meal! This was our first time here and it was excellent. Food and service were great, never felt rushed, and they offer a nice Sunday brunch options. Really good mimosas. Look forward to seeing you again soon. It’s tucked away in a business park but once inside you are transported to Istanbul. Delicious food and good service. The live music made it impossible to have conversations. It was unexpected and made for a disappointing evening. The food, as usual, was excellent, but food isn’t everything. The music started at 6:30 so it was impossible to escape. Our group will not return for our monthly dinners if they continue to have the music. Food was good. Ambience was a little loud for me personally as they had live music for a Tuesday night. Didn't ruin the evening but made conversation more difficult. Overall I enjoyed the experience and we were treated well by the staff. We had a very good meal at Rudy's. We were on the early side for dinner, so there wasn't a crowd, and it was quiet. Food was delicious and portions were good. We'll be back! (U) We love Rudy's. On this occasion the food was excellent as always, but because there was a large gathering at the same time we were there, the service was almost non-existent once that group arrived. We were lucky our food was served before they occupied the attention of the staff. Perhaps Rudy's should consider bringing on an extra server for occasions when they know there will be a large group. Please don't let this review stop you from going to Rudy's! 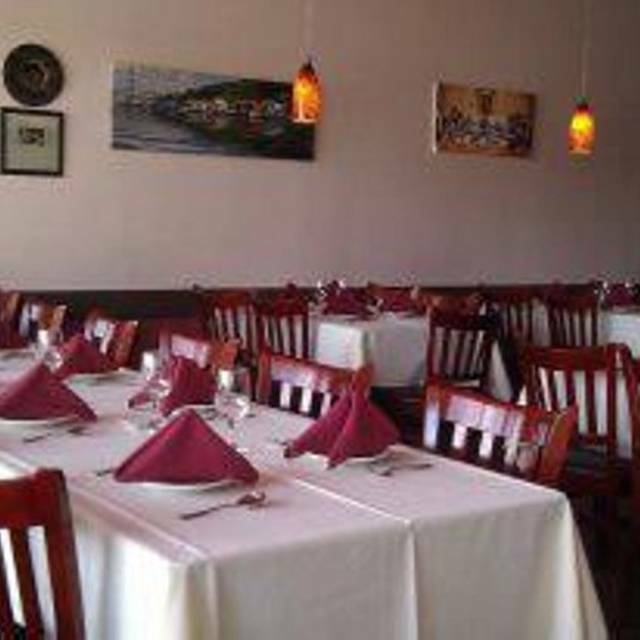 They serve authentic Turkish food -- have a great selection of options, and the food is always excellent, many dishes are truly outstanding and the servers are wonderful and helpful. They also serve breakfast and a brunch on weekends - we are so glad Columbia is their home! My friends and I loved and enjoyed delicious foods including Turkish homemade dessert. People there were friendly as usual and fully satisfied!! Worthy to drive there from DC and Baltimore.